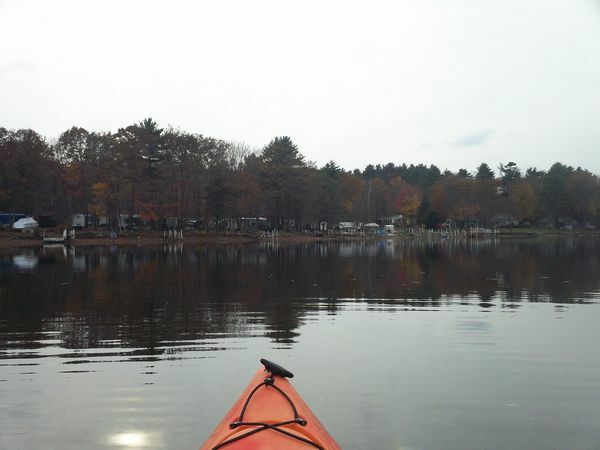 On Saturday, October 27, 2012, we made an effort to go out kayaking as we figured it would be the last chance of the season. A killer storm was bearing down on us, slated to hit on Monday or Tuesday. That would deluge us with rain for the entire week. And after that, it being November, we probably would be too cold to go kayaking. So when we had sunny weather on Saturday, off we went. It was an *amazing* day. The foliage was lovely although certainly past its peak. Even better, though, there was a full rainbow halo around the sun! I first noticed it by looking at the mirror-smooth water. Nobody else was on the pond but us. I saw a circular rainbow ball in the water! I was amazed by it. So then I looked in the sky and I saw it was up in the sky! Bob pointed out that there was in fact one on either side of the sun. I took a number of photos of this. Over our kayaking time we saw that these were the two bright points in a full ring. I also had fun rescuing a ladybug. I went past it and saw it floundering in the water. So I circled around and attempted to scoop it up. I nearly swamped it a few times, but eventually I got it up and onto my sweatpants leg. It dried out for a while, then Bob came by and took it. It liked being on his hand and warming up. It stretched its wings a bit, drying them out. Eventually it decided it was time to go, and it flew off towards shore! Bob followed along to make sure it got there safely. There are 117 photos in the set. At the end are some photos of a juniper tree at the Manchaug boat launch area; it was the first wild juniper tree we'd seen in Sutton. The pictures on the topic of kayaking Manchaug pond Sutton MA for this slideshow were all taken by Lisa Shea. Celebrate your enjoyment of Manchaug Pond with these gorgeous tshirts, mugs, tote bags, and other items all emblazoned with the gorgeous autumnal foliage and crisp, blue waters of this lovely area. The images are available both saying Manchaug Pond and Manchaug Lake, so you get to choose!